Tierney, New Bedford board member, decries ‘duplicitous’ arrangement with consultant. 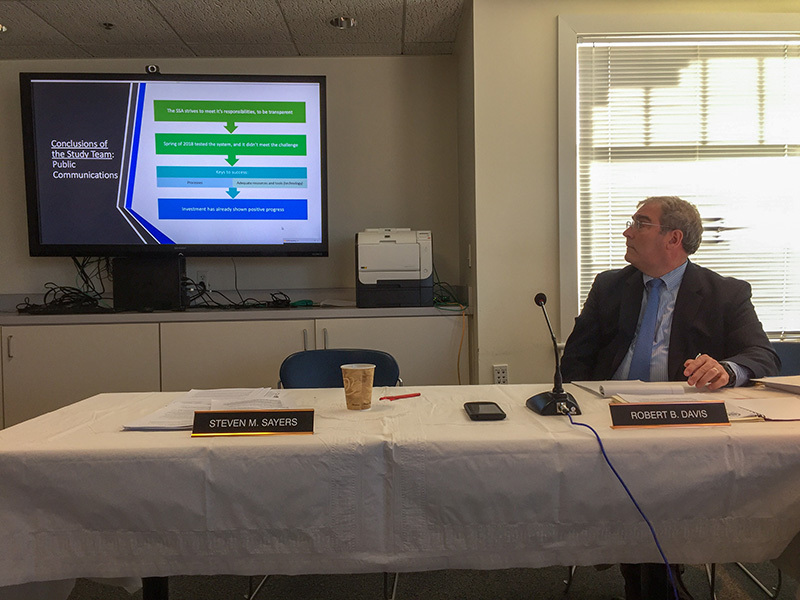 The Steamship Authority board met Saturday for a special meeting held to review the last element of the HMS Consulting report — communications — which was held up for months. Via audio link from Seattle, HMS Consulting president John Sainsbury walked the board through a slideshow synopsis of the communications findings and recommendations. Then after scant discussion, chairman Robert Jones advanced an agenda item pursuant to hiring HMS to the tune of $135,000 to help craft an implementation roadmap for the majority of its report, and the wheels came off the bus for New Bedford board member Moira Tierney. Tierney said she was at a loss for why HMS would be allowed to bypass a competitive bid process, especially in light of the tardiness of the communications portion of the report. Tierney recommended sending out a formal RFP for help implementing the HMS report. Former general counsel Steve Sayers, who remains an advisor to the SSA, especially in regard to the consultant’s report, defended securing HMS once more. He pointed out their rate, “which is less than $200 per hour,” is a bargain, and said it’s advantageous to use the deep knowledge of the SSA they now possess to act quickly to address the issues they’ve highlighted. He also said HMS agreed it would be a conflict for them to help facilitate safety management system (SMS) and quality management system (QMS) implementation per their report, and therefore those components should go out to bid. Tierney didn’t buy into his arguments, and described securing HMS again as “duplicitous.” She further said the amount they would charge for new services is equivalent to the salary of one of the executives the SSA needs to hire. The SSA is currently down a treasurer/comptroller and a human resource director. And per a 4-0 vote Saturday, it will seek a director of health, safety, quality, and environmental protection (HSQE) and a director of marine operations, in accordance with recommendations put forth in the HMS report delivered in December. Sayers affirmed his position with Tierney by saying normally he’s a strong advocate for RFPs, “but in this case HMS has given us specific recommendations, and they’ve also said that this process is to [explore] alternatives to those recommendations …” Sayers went on to say those alternatives could yield beneficial efficiencies. Vineyard board member Marc Hanover and Nantucket board member Robert Ranney supported tapping HMS once more. Each used the word “expeditious” to describe the utility of going straight to HMS. Hanover said while he appreciated Tierney’s reservations, he believed management has no time to take another route, and he also believed quickness of action was paramount. 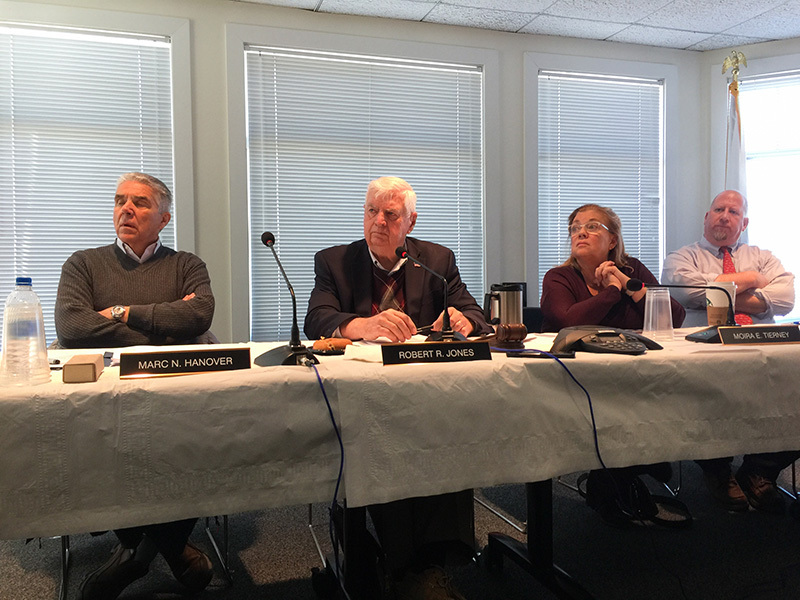 Chairman Robert Jones, Barnstable’s board representative, also supported a direct solicitation of HMS, counter to a stance he took at the previous month’s meeting in Falmouth, where he leveled criticism at the lateness of the communications portion of the report. Asked about his change of position on HMS after the meeting, Jones said while he was “extremely ticked” at the delay in the communications report, the proposal HMS submitted on implementation strategies so impressed him, he became willing to overlook the tardy delivery. Nothing her fellow board members or SSA management said could change Tierney’s opposition to hiring HMS. “I can’t support it,” she said. The board went on to vote 3-1 to secure HMS for the job. Later, when general manager Robert Davis brought forth an RFP package for consulting on SMS and QSM to be voted on, Tierney wanted no part of it. She had previously argued all consultation on the HMS report should be sent out in an RFP, as opposed to select portions. The vote was 3-0 with one abstention —Tierney. But he admitted bus logistics didn’t make the report. “We did not look at, necessarily, dispatching of the buses,” he said. In an interview with The Times after the meeting, Davis and spokesman Sean Driscoll said the Steamship Authority has met with some Tisbury officials in an effort to improve communications between the ferry line and the town’s first responder leaders. Harbormaster John Crocker and Fire Chief John Schilling previously expressed concern they were not contacted by the SSA during the blackout of the MV Martha’s Vineyard on the evening of St. Patrick’s Day. The Steamship Authority released the independent review Friday, which shows that the ferry service is “too reactive in its communications,” and lacked a plan or the resources to implement one. The report was discussed at a meeting at the SSA’s Hyannis terminal Saturday at 9 am. The Steamship Authority offered Vineyarders interested in going to the meeting a shuttle bus ride from Woods Hole to Hyannis and back. The report comes more than a month after HMS Consulting released its top-to-bottom review of the Steamship Authority that called for sweeping changes. The only missing piece in that report was communications, which HMS outsourced. 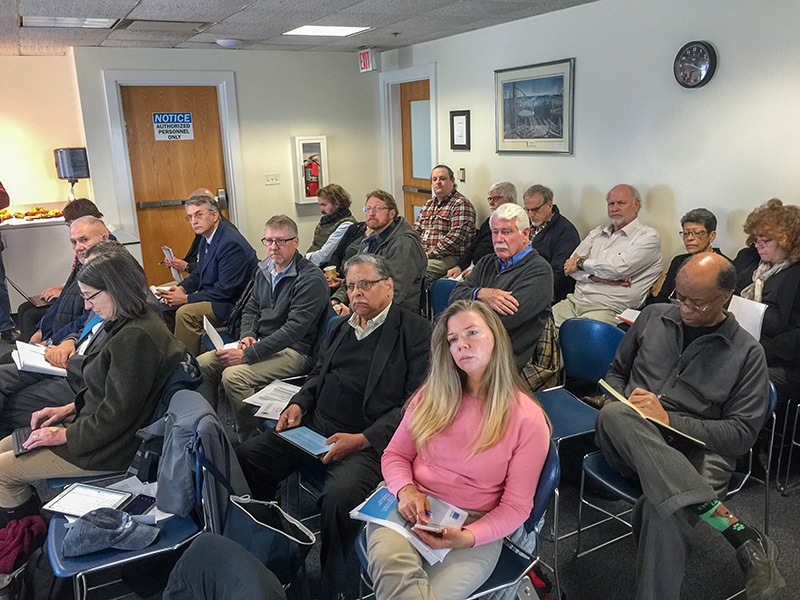 The top-to-bottom review was ordered by the SSA’s board after a series of ferry fiascoes last spring, particularly in March, that included one serious mechanical failure that left passengers between Vineyard Haven and Woods Hole stranded at sea on St. Patrick’s Day into the early morning hours of March 18. The report is critical of how the SSA informed its passengers of problems, saying that at times it was too much information and not timely enough. “An examination of the public communications process in which the public was notified regarding service disruptions (cancellations, delays, and schedule updates) revealed the potential for breakdowns in the communications chain when messaging the public,” the report states. The report also suggests the SSA do a better job using technology, something that has been added in recent months with Twitter and Facebook posts. And in perhaps the most damning portion of the report, the consultant criticizes the SSA for the signage — or lack of signs — at its facilities to direct and inform passengers. The communications report is just 29 pages, much shorter than the overall report released in December. But the report cuts to the core of what the public was upset about with the ferry breakdowns — a slow trickle of information, with reports of canceled ferries sometimes after the fact. In the end, the consultant found that the SSA is working on or has already addressed issues. “It was the impression of the study team that the leadership at the SSA made every effort possible to achieve a high level of transparency with the general public, in some cases above and beyond what the team felt was necessary,” the report states. The authority points to steps already taken to improve communications, including hiring a communications director, as well as establishing an operations and communications “nerve center” at the authority’s new headquarters in Falmouth. A crisis management plan is being updated to establish a “clear and established chain of command and a plan to gather and disseminate information” for up-to-date and urgent situations, the release states. Once again, Davis points out that there are likely costs associated with implementing some of the recommendations made by HMS, particularly because it calls for hiring additional staff. George Brennan contributed to this report. Updated to add more detail from Saturday’s meeting. – Ed. Time for the island to face facts. Davis is nothing but a glorified beancounter. Why he is leading the SSA is unclear. Zero operating experience. Zero. Until his board steps up and moves to a more passenger centric culture we will all suffer from a culture that is simply not right. Insanity is thinking the Steamship Authority will ever fix the problem.It’s time to build the Bridget Tobin Bridge to the island. Imagine being able to come and go to the island anytime you want. Keep the crossing rate the same so no increase in traffic to the island.The housing crisis will disappear when cheap housing is only twenty minutes away. Please allow me to offer translation of the final paragraph: “Blah, Blah, Blah, the public should be bowing to us, Blah, Blah, Blah. Also, rates are being increased to help expand our already bloated staff”. ‘Deserved’ reputation my a**! The SSA reaps what they sow.